Overcome Panic Anxiety - focuses on your mindset to not only help you cope with anxiety and panic but to deal with the depression that they cause. Helps to create a focus on calmness and peace. 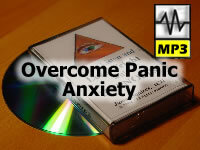 Now you have made a conscious decision to have no more anxiety or panic and no depression. What could be easier? Just do as the title suggests; Relax, Listen to the soothing voice of James Squires, Advanced Clinical Hypnotherapist and accomplish your goal. Listen to the soothing suggestive therapy in bed as you drift off to sleep or while relaxing in a comfortable chair.